Since terrorist attacks in Paris and in Brussels, the world learned the existence of some of the “beek” places in Brussels: Molenbeek, Maalbeek, Schaarbeek. The question that could come to mind is: Are there other “beek” in or around Brussels? Only around Brussels? What does this suffix mean? Belgium is a very small country in the Western part of Europe. It lies between The Netherlands, Germany, Luxembourg and France. Despite being so small – around 30 528 km²/11 787 sq mi or the size of Massachusetts – it has a marvelous cultural landscape and has successively received, along history, Celtic, Latin, Germanic, Saxon, Dutch, French and German influences. These influences have shaped the toponyms (place names) and it is still possible today to retrace the origins of most names of villages and towns. The origins are often seen in the suffixes and this leads us to think that all places with similar suffixes have the same origin. This is often true but not always. Most of the place names are nowadays very strongly influenced by the language region they are located in. Belgium has 3 national languages: Flemish (spoken in the Northern part of Belgium), French (spoken in the Southern part), and German (spoken in the Eastern part). Brussels is considered being bilingual (Flemish and French) but most of the inhabitants speak French. In this articles, we will focus on the suffix –beek and language-influenced derivatives –bach –bais –baix –becq –beke. Beek initially comes from the Old Flemish and means “stream” or “small river“. The English pendant is –brook (not to be confused with the same sounding –broek in Flemish which stands for “marsch”). The old Flemish word “Beek” comes from Old German –baki which gave later birth to bach. On the map, we see a lot of “-beek” places near Brussels and Leuven. This is a characteristic of the former Duchy of Brabant established in this area in 1183. All of these places refer to a village where a river is crossing. 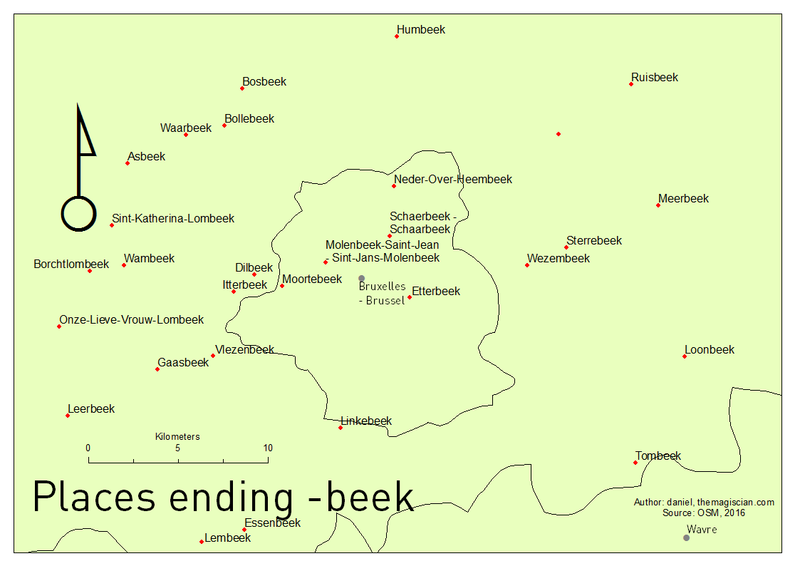 The ending “-beek” has however seen many changes over time. The ending is also different depending on the accent or the language of the region the village is located in. Membach in the French speaking part of Belgium. In the Walloon part, those –beek –beke and –bach places have been translated to –becq, –bais and –baix like Clabecq, Marbais and Molenbaix (the French Molenbeek?). These villages are found in the Western part of Belgium, near the Flanders-Wallonia border. The –bais ending is typical for Walloon Brabant while -becq and -baix are common in Hainaut and French Flanders. Define the layout and print ! 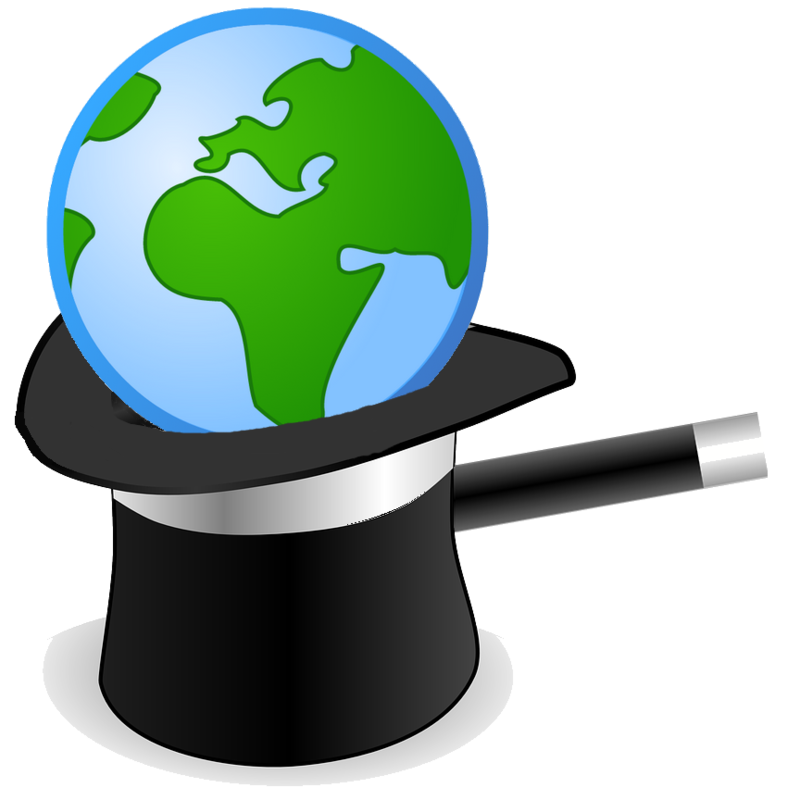 OpenStreetMap makes it possible to filter and to download lots of information. So is it possible to get place names. Attention! I used a rectangular bbox for getting all the places. So foreign places are also included inside the downloaded file! To keep only Belgian I got an external Shapefile from the national border of Belgium and I did an Intersect (it is als possible de get directly only the Belgian places in the Overpass query). The raw csv file that was downloaded has to be converted to a geographic data. I used the Create Feature Class > From XY Table to convert it into a Feature Class. The Kernel Density calculates a magnitude per unit area using a Kernel function. The result is a tapered surface representing the density of points. The default symbology applied to a Kernel Density result is blue. I changed it to a orange scale symbology. The layout is a A4 format with all the basic and necessary cartographic elements: North Arrow, Frame, Scale, Title, Author, etc. For the Kernel Density geoprocessing, I created a small Python script to bring automation in the process for all the maps. Applying the symbology to all layers has also been automatized via this Python Script (In fact, I take an already existing symbology and I apply it to all the others).